Less than 16 hours left until the recount deadline, Palm Beach elections officials say they are likely to miss it, while Broward says they're poised to make it on time. NBC 6's Laura Rodriguez reports. With the deadline for counties across Florida to turn in their recounted ballot results just one day away, one South Florida county is breathing easier after finishing their recount while another continues amid lawsuits and continued criticism. Workers in Broward County continued through Tuesday night and into Wednesday after separating and processing thousands of ballots an hour through tabulation machines for a second time. By the afternoon, elections officials said all vote by mail ballots were processed and that they expect to be finished with election day ballots by early Thursday morning. Broward Supervisor of Elections Brenda Snipes also told reporters Tuesday that they would meet the deadline. "We will complete the recount. There's never been a deadline that we have missed," Snipes said. Additional sheriff's deputies were sent to guard ballots and voting machines, a compromise aimed at alleviating concerns. The election recount drama has been intensifying as lawyers return to court and tallying machines broke down ahead of the Thursday deadline to complete reviews of the Senate and governor races. Much of the trouble has centered on the Democratic stronghold of Palm Beach County, where tallying machines have overheated. That's caused mismatched results with the recount of 174,000 early voting ballots, forcing workers to go back and redo their work with no time to spare. 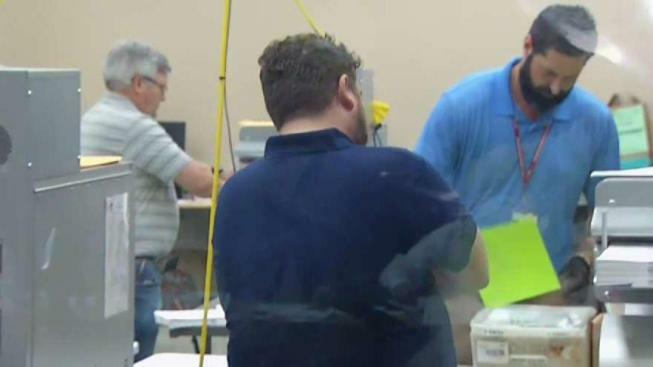 A mechanic was flown in to fix the problems, but "we don't have a lot of assurances," Palm Beach County Elections Supervisor Susan Bucher told WPTV Tuesday night. Bucher did not immediately respond to messages from The Associated Press on Wednesday. Meanwhile, lawyers for Democrats planned to ask a federal judge on Wednesday to set aside the state law mandating that mailed-in votes be thrown out if the signature on the envelope doesn't match the signature on file. There are now multiple lawsuits piling up in a Tallahassee federal court challenging everything from the rules used for recounts to Gov. Scott's role in supervising the state office that oversees elections. U.S. District Judge Mark Walker, citing a well-known "Star Trek" episode, said during a hearing Wednesday that "I feel a little bit like Captain Kirk in the episode with the Tribbles where they start to multiply." The developments are fueling frustrations among Democrats and Republicans as the recount unfolds more than a week after Election Day. Democrats have urged state officials to do whatever it takes to make sure every vote is counted. Republicans, including President Donald Trump, have argued without evidence that voter fraud threatens to steal races from the GOP. Florida Republican Sen. March Rubio said Wednesday that he wants every legal vote to be counted. "I'm not against the recount. A recount is mandated by law and should happen. The recount should happen, and every legal vote should be counted, but what we should not see happen here is that somehow lawyers are able to find federal judges that change Florida election law after the election, go in and basically order the state of Florida to ignore its own laws," Rubio said in a statement Wednesday. "You cannot change the rules of the game after the game in order to win, because that would be stealing an election and that would be unacceptable." Scott was in Washington D.C. while the court battles raged on. He stood at Senate Majority Leader Mitch McConnell's left shoulder Wednesday when the Kentucky Republican welcomed GOP senators who will take their seats in January when the new Congress is sworn in. During the brief photo op in McConnell's Capitol office, Scott did not reply to a question about whether he contends there was fraud in the election. Daniel Nordby, a lawyer for the Republican governor, told a federal judge Wednesday that Scott will recuse himself from the state's canvassing commission. The commission is a three-member panel that officially signs off on election results in state and federal races. In South Florida, dozens of workers keep feeding ballots into counting machines at the Broward and Palm Beach County elections centers. Much like feeding documents into photocopiers, they've been placing stacks into feeders that run through several ballots per second. Then they grab another stack and do it again. Trump has called on Democratic Nelson to admit that he lost his re-election bid. Presidents have historically sought to rise above partisan dramas surrounding election irregularities. Former President Barack Obama wasn't so publicly involved when a recount and legal process in the 2008 election delayed a Democrat taking a Minnesota Senate seat until July 2009. Former President Bill Clinton struck a quieter tone during the 2000 presidential recount, which also centered on Florida. But this Florida recount has been personal for Trump. He aggressively campaigned in the state, putting his finger on the scales of the Republican gubernatorial primary by endorsing DeSantis. After Election Day, Trump's aides pointed to the GOP's seeming success in the state as a validation that the president's path to re-election remained clear — a narrative that has grown hazier as the outcomes have become less certain. Marc Elias, an attorney for Nelson, argued that there's no need to rush, since the winner of the Nelson-Scott race won't be sworn into office until January.